Recently it became possible to post an UNGRADED discussion to a specific section using the "Post to" option. See #4 in image below. You can create section-specific discussions for ungraded discussions by selecting one or multiple sections in the Post to drop-down menu . I have a teacher who has been using the discussion feature for several years. She created a discussion and made an understandable mistake by choosing the "Post to" box to choose a specific section of her course. Once she did that, she was no longer able to choose the "Graded" option, which is below the "Post to" option. You have to go back to the "Post to" box and change it back to "All Sections" to get the "Graded" option to be clickable again. On the other hand, if you were to choose "Graded" first, then the "Post to" option (above) goes away. It would help things a great deal if this were offered on the screen in reverse. That is, put the "Post to" option below the "Options" section that includes "Graded." Also, clarifying that the "Post to" option only applies to UNGRADED discussions would help clear up the confusion. I have put in a support ticket about this and they are considering it as a "user experience issue." They tell me that they "use cases marked like that in discussions with our development team to help define development priorities." Perhaps I should put this in as a feature request? Although, honestly, I view it as something that is not functioning properly. 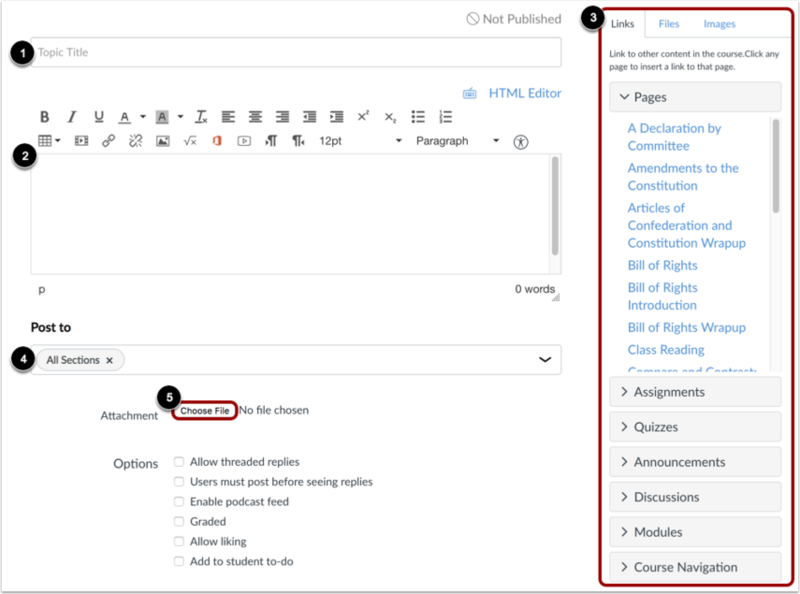 "Additionally, when creating a non-graded discussion, instructors can create section-specific discussions in their courses for all sections, one section, or multiple sections. I believe it would be nice to be able to assign graded discussions to sections. If you create a FI like this I would definitely vote for it. If you do create this, please link it here so anyone reading this thread in the future an also find the feature idea! I am not so sure about switching the post to and options menus. To me it seems logical that if you don't change the discussion away from "everyone" that all of the options can then be selected but if you first assign the discussion to a section that the graded option goes away . . . but that is just me. Others may have particular insight into the entire feature, so I am going to switch this from a question to a discussion. I agree that it would be helpful if there were some way to bring greater attention to the fact that graded discussions cannot be assigned to particular class sections. Thanks again for the heads up and bringing up this topic! I have a course that has 4 sections. How can I separate each section's discussion posts? That's why, I think when you see that "Post to" option right up front, it's exciting...hey, I can finally do this! So you choose a section and then you can't click on "Graded" and you don't know why. I believe it should work like the "Not Graded" option in Assignments. When you choose "Not Graded," other options below go away, like "Submission Type", because they don't apply. So - you choose "Graded," the "Post to" BELOW goes away. You don't choose "Graded," the "Post to" option stays. Thanks for posting this information! Our university is beginning to migrate to Canvas, and we found these features very unintuitive and troublesome. Do you know if there is a product idea to vote on that would move the "Graded" feature above the "Post to" section? Additionally, I couldn't find much support explaining these differences. Might you be able to point me to some documentation on this? How do I create a new feature idea in the Canvas Community? I did not previously submit it as a feature idea, but did submit a support ticket and was told it was a "user experience issue." Let me know if this answers your questions.